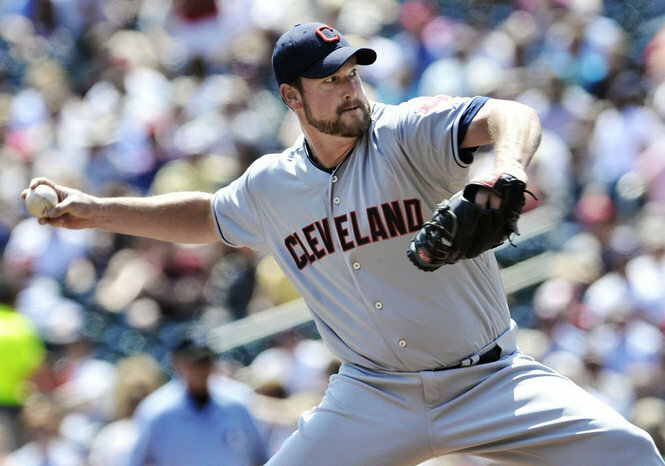 So who had Derek Lowe in the American League Cy Young sweepstakes? The 38-year-old Lowe notched his first shutout in seven years as the first-place Cleveland Indians beat Minnesota on Tuesday, 5-0. In the process, Lowe became the first pitcher since 2002 to throw a shutout without striking anyone out. After only winning nine games last year with the Braves, Lowe is now 6-1 on the season with an ERA of 2.05. “It’s been a really gratifying start,” Lowe said after the game. “Coming into the season, there were so many questions about ‘Are you done? Are you going to retire? Blah, blah.’ So I worked my tail off, not just to prove people wrong, but to get myself back to where I knew I should be. It did take Lowe 127 pitches to complete the game – about 120 of them sinkers. And we have to give some love to the return of the Acta Ball magic from last season. Acta shuffled the lineup against the Twins and put Shin-Soo Choo in the leadoff spot. On Monday, Choo drove in the winning run in the ninth inning; Tuesday he had a solo homer in the fifth inning. The Tribe holds a two-game lead over Detroit in the Central Division as they now come back to town to open the longest homestand of the season with two games against Seattle. The only bad news is, with his next start scheduled for Sunday, Lowe will miss the Tigers when they come to town next week.